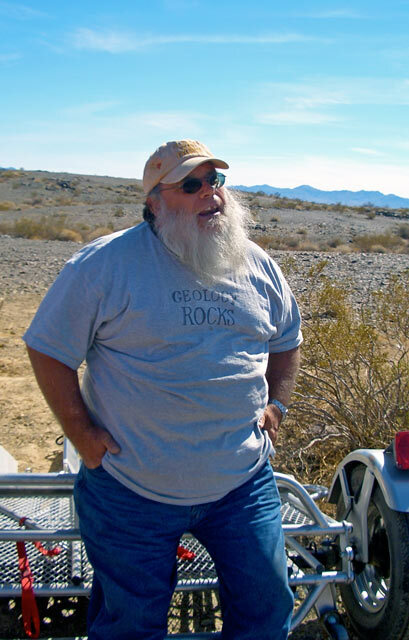 Bob Dunkin, 29 Prospector, left us early this morning for better diggings. there are no explanations needed. there are other aspects of him that are worth sharing. either dry washing or tearing down one of the unforgiving dirt roads in his beat up Toyota truck. I think he liked that way. He seemed as much a part of the natural surroundings as the windy, sun swept hills. He was a repository for much of the history and many of the secrets this unique and mysterious desert region has to offer. but you would not have known it. all this came far ahead of any talk of himself or his ailments. If you turned 360 degrees in the Pinto Mountains, he seemed to have a story for almost every hill your could see. money he probably should have saved for a house payment or some medicines. He could not get enough of the desert and it seems the desert reciprocated. it revealed a path to him when he had lost his way. I have never had the pleasure of meeting Bob either but have enjoyed his posts many times. He had a talent to make you actually think about lifes everyday moments that we sometimes miss. Too often we take friendships for granted and think that we will always have another day to be with that special someone who will "make our day". Reading some of Bobs posts would give me them "a hah" moments a lot of times. I will certainly miss his posts and stories for sure but now Bob can share some of his stories with "The Big Guy" up there. Rest in peace Bob, although we never met other than on the forum, I feel that we were friends and I will miss you, this is a great loss for this forum and your many friends, they say that Heaven is full of gold and now Heaven has even more with you being there. Thanks for the news Flak. I did have the pleasure of meeting Bob and watched as he taught Drywashing 101 to a couple young boys out there in the Dale -- complete with tales of Tommy Knockers. Nugget remembers the peanut butter & jelly sandwiches Bob shared with him. He did live through tremendous pain and suffering and I'm sure his will to get back on his feet to help others had a lot to do his early departure. Only the good die young and he was one of the best. Rest in peace Bob. We will miss you. Damm that is bad news. First time I met Bob he loaned me his goldbug and had never met me before then. He had the biggest heart and you couldn't help but love him at first site. I hope he made it to the garden of gold R.I.P. Bob. How very sad to hear of his passing. I would loved to have met the man, and listen to stories around a campfire....God be with you Bob Duncan. I had the honor and pleasure to meet Bob in person only once, but I can still hear his voice, filled with enthusiasm for all things prospecting related. We conversed over the phone and through email over the years and his desire to share with and help others never waned, even when he was down physically. What a great loss in knowledge, experience and generosity. What a great place this world would be if more of us were like Bob. My condolences and prayers to his family and friends...Jim P.
Gonna miss old Bob, rest well my friend. Bob Dunkin, AKA 29PROSPECTOR, celebrated his sixth birthday being allowed by his father to ride down the ore bucket all by himself deep, deep and deeper still, down the shaft of a Dale District gold mine. The descent grew darker and darker. The air became still. The place was utterly quiet. Bob didn't like it. He loved it! From the moment of that rite of passage his love affair just grew stronger. He eagerly learned the skills of a hard rock miner from his father and from his father's fellow miners. He listened intently to their stories. He dreamed many of his own. It was my rare privilege to be an audience of one over many, many desert campfires shared with this desert raconteur and master storyteller. The only one in his same class was Paleface, the late Jim Smaller. I will never forget the night in Gold Basin when those two went at it, spinning one hard rock tale after another until they were the only two still pitching kindling into the fire. And now they are gone -- gone from this earth that they loved so well. But not before leaving some of themselves behind. And for this we all are richer, vastly richer. I didn't know Bob, but I offer my condolances to his family and many friends. I only knew Bob from the forums and a lengthy phone call. My wife asked me what I talked on the phone about for almost 3 hours with a guy I don't know? It was my privilege to talk about mining with Bob. I wish I could have met him in person. RIP Bob. I spent some time with Bob out at his mine. 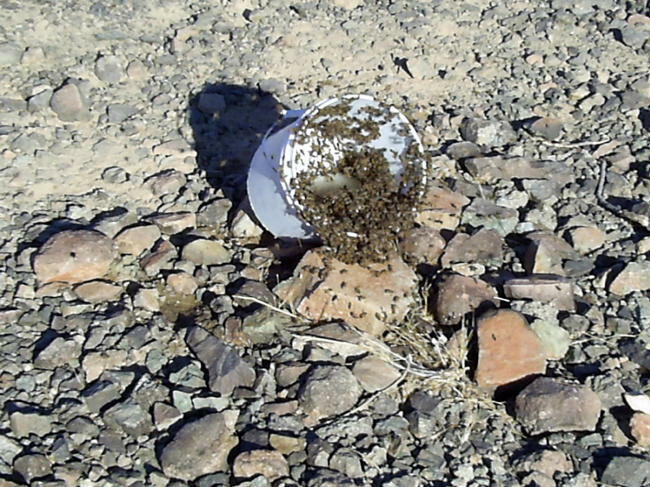 I got a picture of a bucket he had out there with water in it to attract the bees and to keep them off of us. Must have been a million of them out there. They did a good job of keeping Bob's diggins safe from high graders and rascals that didn't belong there. If I can just figure out how to post a picture. Very, very sad news. I would have bet everything I had that this was just a set back. But when the time comes there's no arguing to the chief, He does have the last say and I still havent' met anybody that has bought a return ticket, usually just one way. Enjoy what you have now. Flak, well said. I wish I was as close to Bob as you and Denny were. Your gain, my loss. To Bob's family and friends, our prayers go out to you. Bob had nothing to lose, only to gain. An unbelievable character, a true prospector and a terrible loss. He now skips among the russet sized nuggets, with a big grin on his face. A message from Bob, just shows his love for prospecting and how he would give the shirt off his back. I talked to Denny last night and he said that you might be interested in coming to the Dale area. Well allow me to extend to you another invitation to come on out. Let me know and I can go out with you. Preferably after the Holidays. Interests:Nugget hunting w/detector, ham radio, gardening. So very sorry to hear this. Many a good breakfast with Bob at Denny's when we were in town. Evelyn and I enjoyed his stories and always looked forward to seeing him. We will miss you my friend.